Internet Movie Database - An encyclopaedia of movies. Pretty much anything you wanted to know about that DVD you're about to watch is in here. The Sound Recordings catalog comprises over 17,400 digital audio files, beginning with Lomax’s first recordings onto (newly invented) tape in 1946 and tracing his career into the 1990s. In addition to a wide spectrum of musical performances from around the world, it includes stories, jokes, sermons, personal narratives, interviews conducted by Lomax and his associates, and unique ambient artifacts captured in transit from radio broadcasts, sometimes inadvertently, when Alan left the tape machine running. From the 60's to the 90's under its many names (ETV, Continuing Studies, Extension Services, etc.) Memorial University had a rich history of using video for education and community-based projects. Here are 3,244 of those videos. Des Walsh: Just thought I'd post a link to the Writer's Guild of Canada's Canadian Screenwriter Magazine which had an article on my brother a while back. The Antidote is a professional medical billing program I wrote for physicians in Newfoundland & Labrador. This is an update page for Antidote Users as well as an information site for the software itself. BTW the Home Button on the Antidote Page does not take you back here. Tickle Harbour is a Newfoundland Celtic Band I played in for 20 years. The music page is basically made up of Newfoundland Music and Celtic Music. The Celtic Music link is basically links to some of my favourite celtic sites. Tunes and Songs, Folk Festivals and Venues, Instrument Pages, Artists, Radio Stations, Record Companies and Magazines, Music Stores and Other Links. You'll also find links to some of my favourite sites in the Newfoundland Music Page. There is also a page containing all the CDs, Cassettes and LPs I've been involved with over the years. There are photos of the jackets plus all the liner notes for each project. The Heritage Website explores the history, society, culture and natural environment of the province of Newfoundland & Labrador. This site is truly worth a visit. Everything you wanted to know about Newfoundland & Labrador but were afraid to ask. The link below will take you to a page on that site dealing with the resettlement program. 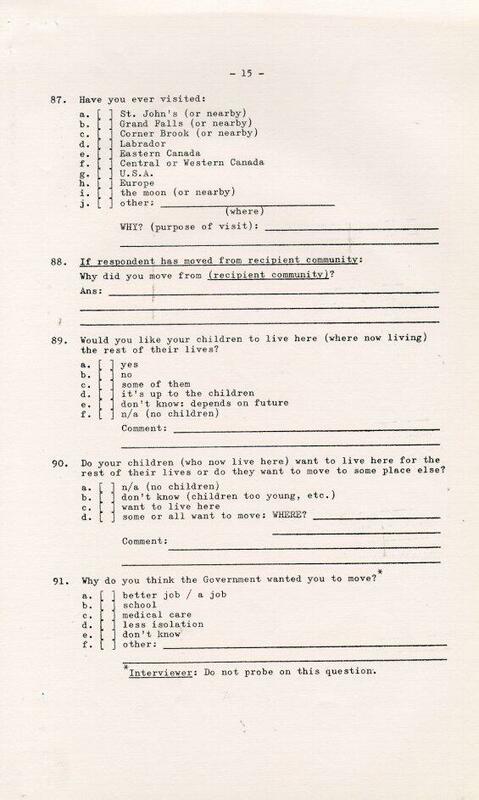 The document is from a household questionnaire that was used by the Newfoundland government in 1966 concerning the resettlement program. Can anyone out there explain option i of question 87? The St. John's page has links to Weather Reports, Local Cinemas, A History of St. John's and other links. On my photos page you'll find a Section on St. John's. Amoung the photos in there you'll find a couple of panoramas, one of the city and one of the harbour. SingSong Inc. is a Newfoundland recording company owned and operated by performing artist Jim Payne. It was started in 1989, and is dedicated to traditional and contemporary music, story, song and dance that reflect the Newfoundland experience. The label has eleven currently available titles, making it the largest traditional music label in the province. SingSong Inc. recordings are distributed in Canada by Tidemark Music and Distribution and by Camsco Music in the USA. They are also available by mail through the address at their website. Visit their website to find information about the recordings, the artists, events and performance schedules and upcoming SingSong releases. Being Canadian and sometimes ordering golf clubs etc. online from the US I expecially like the Royal Bank Currency Converters so I know ahead of time what I'm in for. I put this page here for my own benefit. Sometimes when I'm staying with a friends, family or just visiting someone I often whish I had my cook books with me when I decide to make a meal. With this page I do. Here are some of my favourite recipes. I noticed that when I tried to print a recipe the whole page printed instead of the one recipe I was viewing. To correct this I've added a 'Printer Friendly' button to each recipe. The Fat Cat Blues Bar is a contemporary blues bar located in St. John's Newfoundland. My pub of choice... it's where I spend my leisure time. Great blues guitar player and mad for off road motorcycles and skidoos. Great guitar/bouzouki player and like me... mad for golf. The link below will take you to a page at Memorial University's Maritime History Archive site. The document is from a household questionnaire that was used by the Newfoundland government in 1966 concerning the resettlement program. If you'd like to contact me you can do so by clicking the email bar below. I found this script on the net and it was written by Jim Tucek. I used to have a web link to his script but alas his site has vanished.